I’m not overly enthused by the word ‘Harmony,’ when used in a “spiritual” context. Don’t get me wrong, it’s a beautiful word with great potential but, I feel, it has too often been used with an undertone of spiritual complacency and fluffiness. I often hear it in reference to some ideal state, when there are no more challenges and everything is ‘perfect’… but perfect according to who? And when? Furthermore, if the world were such a way, would we really appreciate it? I don’t mean that we have to continue to act violently towards one another or to disrespect our planet, but I do feel it is important that we come to terms with the fact that all things change, everything has its season, and one day, we too, will die. For this reason, I happily deleted ‘Harmony’ from my teaching / “spiritual” vocabulary a long while back. So, as you can imagine, when I was asked to write an article under its heading, I met it with some discord!! Then I came across this quote by Dr Randolph Stone, the creator of Polarity Therapy. I feel this quote contextualises the word Harmony in a way I can respond to and resonate with. For me this quote shifts the focus of ‘Harmony’ being an unrealistic, idealistic state that exists somewhere outside of ourselves and has to be achieved, to an engaged appreciation of life as it is, with all its ups and downs, twists and turns and all its shades of dark and light. I feel that we often expend so much energy on trying to make life ‘harmonious’ according to our own inner bias, that we can fail to see that harmony is the music that life is already making. We deny and push down the parts of ourselves that we don’t want to own and fortify the image of ourselves we want others to see so much that it is almost impossible to appreciate life as it is in its fullness. As Edward Whitmont states ‘Repression will always call forth a compensatory counter activity of the unconscious which will, through the back door, force upon us the very thing we are trying to repress.’ This is why it is so important to turn toward life courageously, fully and compassionately. Otherwise, the Harmony we seek will always be sought, not embodied. Mariana Caplan writes ‘the energy invested in keeping the darkness at bay somehow distorts the quality of their light,’ when speaking of some ‘so-called holy people.’ A very part of our being human is that we experience the polarities of life and, through these very experiences, we learn to navigate the dance of shadow and light within ourselves. We behold both as energy, beauty and harmony within the realm of awareness. And in the Yoga Sutras of Patanjali, it is the Klesha of Avidya, or misidentification, that is the root cause of our sufferings. It is through this kind of misidentification that we become entangled within our own ego syntonic projections, unable to see clearly. As human beings, very few of us are exempt from this and it often takes a lot of retraining our relationship towards our experiences to bring about a sense of perspective. Any experience in life has the potential to either liberate or bind us in the moment of its existence depending on how we choose to respond to it there and then. It could be said that another layer of living in harmony would be for the awareness to be so finely tuned to be able to direct a conscious response to each situation. This is where tools, such as the practices we know as yoga can be useful. As Sharon Gannon says ‘You cannot do yoga. Yoga is your natural state. What you can do are yoga exercises, which may reveal to you where you are resisting your natural state.’ It is this ‘natural state’ that is yoga. In this context, the yoga attitude accompanies us wherever we go, whatever we do as a constant stream of awareness and a deep intimacy with life. The practices of yoga offer a means for Swadhyaya, or self-inquiry; a way to know ourselves more deeply and fully that is not fixed. Swadhyaya is a process of re-engaging in inquiry over and over again. We learn to read and respond to the wisdom of our bodies and layers of being with compassionate awareness. It is a case of using our yoga practice to know ourselves with greater intimacy, bravely turning towards as oppose to away from. And, to me, this allows for a greater sense of Harmony with all things, not simply those that are subjectively pleasing and dependent on external circumstances. We cannot move forward apart from where we are. As Neil Donald Walsh says ‘What we resist persists, what we look at disappears.’ We play our part in this ‘great symphony of life’ by learning to listen deeply within, to read the wisdom of our bodies and to respond consciously from moment to moment. Having said this, it is not always within our capacity to hold our sense of harmony within all experiences, especially the ones that are challenging and, perhaps, traumatic. Sometimes the conscious response is to know when enough is enough and wisely take space from a situation or emotion so that it does not catapult us into a bottomless pit of traumatic overwhelm. In these times it is important to have a resource, a practice or a tool that offers us some ground upon which to place our feet and offers support. Again, the practices we know as yoga can be a great anchor during such times, as can any practice that brings awareness back to the body and breath. From this space of ground, we can dip in and out the pockets of unconsciousness within and gradually, and compassionately, hold them, too, in the light of our awareness. It is here that all parts of ourselves can become integrated into life, creating greater harmony inside and out. A wise teacher once drew me a picture of a bird. One wing of the bird represented the ability to be with all experiences as they are, while the other wing represented the resource, the engaged part of the practice that offers a container through which a situation can be observed without losing ground. The bird would not be able to fly without either of its wings. So too, we may become either apathetic towards or overwhelmed by our experiences if we do not tend to both the qualities of being with and engaged resource. 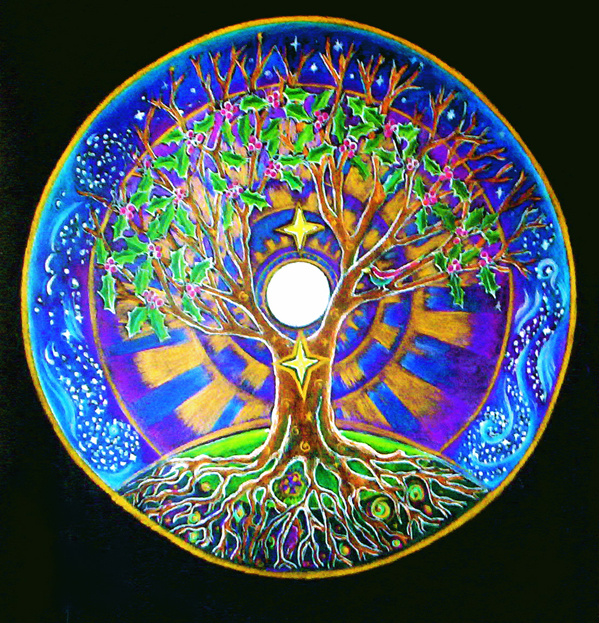 This image portrayed to me that there is Oneness (being with all that seems to shift and change) within duality and duality (the engaged resource) within Oneness. These qualities are inseparable and holding firm to either one or the other amplifies separation and the illusion of disharmony. As with everything in life, there are multiple layers of seeing and perceiving. These layers are not hierarchical; rather they coexist, making how we perceive and digest an experience, depending on our viewpoint, subjective. I would like to acknowledge and celebrate these layers in the context of Harmony. The sum of these parts makes the harmony of the whole rich and ripe.